The survey found that men plan to spend an average of $95 dollars on Valentine’s Day, more than double the $41 women plan to spend. Compare that to what men and women expect their partner to spend -- no more than $39. If you are early into a romance you are more likely to spend the most money. For example, couples who are engaged both plan to spend an average of $92. People who are just dating plan to spend around $88. If you’re married, the spending level drops to $57. 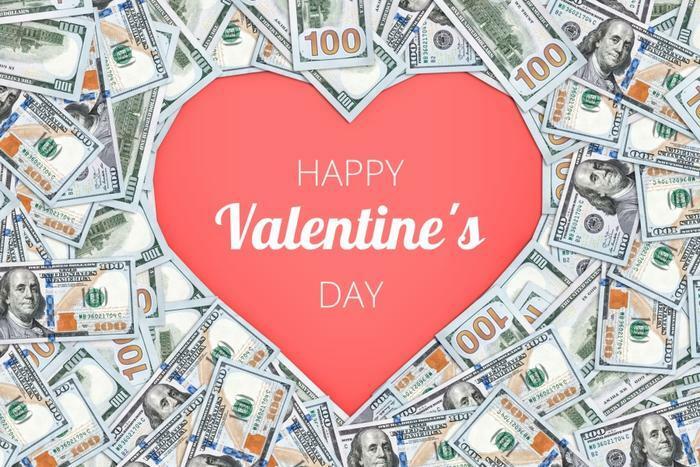 Financial obligations tend to reduce Valentine’s Day spending. Consumers who have car loans, mortgages, or substantial credit card debt plan to spend well under the averages. Generation Z is most in the Valentine’s spirit, with expectations to spend an average of $113. On the other hand, one out of three baby boomers said they would be upset if their partner spent too much money. Here’s a tip: your partner probably does not want the extravagant gift you’re planning. What 32 percent of consumers say they want is a nice meal at a restaurant. Twenty-nine percent would be happy with a card. Women are more likely to prefer a dinner out or flowers or candy. Men, on the other hand, would like a dinner at home or maybe a night out at the movies. Making your mate happy on Valentine’s Day doesn’t have to put you in debt. Esquire magazine notes that most couples’ first date is most likely a movie. It suggests buying her a poster from the first movie you saw together and a copy of the soundtrack. For guys, the website Askmen.com has a number of low-cost suggestions, including the Amazon Dot smart speaker, giving him someone else to talk to besides you.